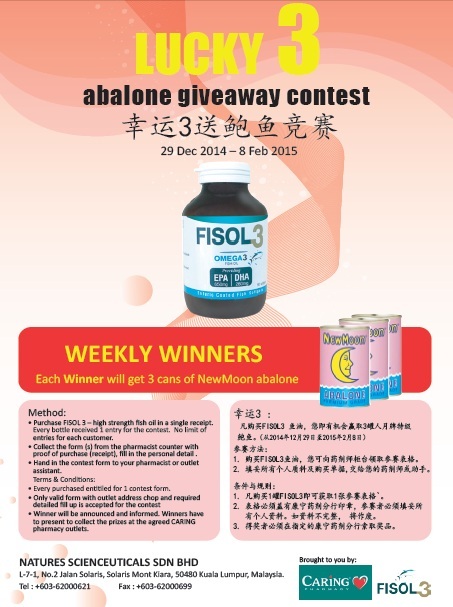 Grab Lucky 3 Abalone Back Your Home @CNY Giveaway Contest | FISOL3 Triple Strength Fish Oil | 3x More than Regular Double Strength Fish Oil - More EPA inside, Faster Results in Lesser Softgels! • Grab Abalone Back Your Home! 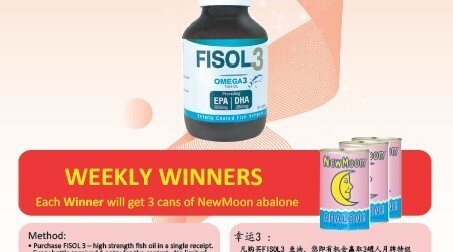 • Purchase FISOL 3 – high strength fish oil in a single receipt. Every botthle received 1 entry for the contest. No limit of entries for each customer. • Collect the form(s) from the pharmacist counter with proof of purchase (receipt), fill in the personal detail. • Hand in the contest form to your pharmacist or outlet assistant. • Every purchased entitled for 1 contest form. • Only valid form with outlet address chop and required detailed fill up is accepted for the contest. • Winner will be annouce and informed. Winners have to present to collect the prizes at the agreed CARING pharmacyy outlets.